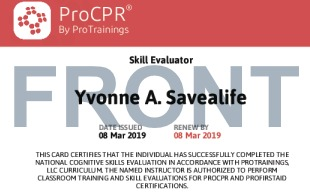 This course will train you on how to be a skill evaluator for Healthcare Provider (BLS) and Lay Rescuer Adult, Child, and Infant CPR/AED& First Aid. Upon completion of this course, you will be able to skill evaluate for ProTrainings courses. Please note, you MUST show proof of completion of a healthcare provider level CPR / First Aid course in order to take this course. 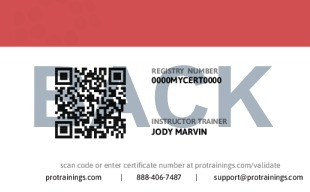 You can complete your training at ProFirstAid Advanced. Total course time includes 1 hour and 33 minutes of video training as well as knowledge reviews, final test, remedial help and reviewing downloaded material.